Next is little Rona, so pretty and such a sweet gentle nature. 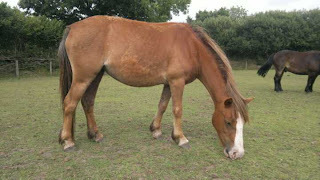 Rona is around 3 years old and 11hh ish. She is a really sweet mare and is very gentle with people. She is often at the bottom of the pecking order but just seems to get on with things. She has mild allergies so would need someone who had experience of this and could keep an eye on her. she loses some condition in the summer due to this so needs lots of care and TLC. I think she would make a fab kids pony / companion with the right home. Maybe you are that home? Goodness hasn't she grown up from the wild little chestnut filly when I stole her mother away!!! If she has the same temperament as her mother, she will make a super pony for some-one. Hobo x Now happy in his new home!! Milo off to a new home with Courage! Merry x NOW available again!! Rowan x Gone off to his new home yay! Buzz x Happily gone to a new home! Tinker x in his new home with Buzz.